Welcome to Hill Country Miniatures. We are a small breeding farm located in Rockwall, Texas, about 30 minutes east of Dallas, Texas. Ed and I have raised miniature donkeys since 1999, and have successfully raised, shown and sold them all over the world. We have donkeys in South Africa, Australia, England, France, Spain, Belgium, and Canada. We have bred numerous national champions. We now have switched over to breeding Miniature Silky Fainting Goats. I fell in love with miniature silky fainting goats when we were visiting a friends farm. We went to several shows and I was so impressed with how nice all the goat breeders are. We visited several farms and I purchased several goats from several excellent breeders including Randolph's Miniature Silky Goats, Flying J Fainters, Aislinn Meadows Mini Silkies, Redneck Acres, Bells Goats, Jubilee Farms and Signature Feathers Miniature Silkies. As with the donkeys, we purchased the best bloodlines and animals that we could, because Quality breeds Quality. We spend lots of time with our goats and make sure that they are imprinted at birth, as well as spoiled rotten. They are routinely exposed to our teenage daughter, our young grandchildren, and surrounded by our boxers, our cat, our donkeys and our chickens, so they make excellent pets. Please join us on our journey to breed, show and love these silly, sweet, gentle animals. Please contact us if you see something that you like, or to see what we might have available. We can send you a video or photo's. We are also very experienced in overseas shipping. 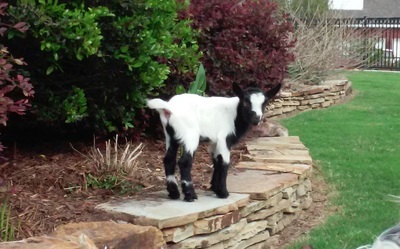 Mini Silky Fainters are usually very small goats, averaging 22 to 25" tall. They are very friendly and gentle, and make great pets. They are very rare, with about 6,000 registered at this time. They do not have to faint, but silky, long hair and facial hair is desirable. They should look like mini terriers in appearance. Upkeep: Many people ask about upkeep of these coats. They do need a thorough brushing in the spring to get rid of the winter fur. If you want a pet, that is all that is required to keep the coat in shape. To get the show coats is another matter. They must be brushed weekly, conditioned monthly and sprayed with detangler. The goats need regular shots to prevent diseases, worming when they need it and hooves checked and trimmed every two or three months. Most goats do well on a diet of coastal hay or alfalfa. We feed mainly coastal hay free choice, with alfalfa pellets each day. We also mix in black oil sunflower seeds to give them extra oil for their coats.They require minerals and baking soda to be available daily and the boys need aluminum chloride to help them avoid stones. They do not need daily grain, and in fact it is not good for them. We have dog houses scattered about the property and they love to sleep in them and jump on them. We also have a large run in shed to protect them from the elements. These goats are quite hardy and require minimal upkeep. If you are on our mobile site, please click on the small bullets at the upper left side of the page. It will take you to many other pages, including the for sale page, doe page and buck page. If you see something that you like that is not listed on the for sale page, contact me at 214-335-0024 and I might be able to part with that animal. I try to only keep 25, so we can keep them well socialized.